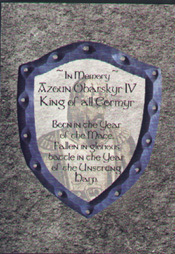 TSR included a 5"x3.5" card with Dragon Magazine issue 274 to mark the death of King Azoun Obarskyr IV. The card is printed on both sides. Image and text copyright 2000 Wizards of the Coast. 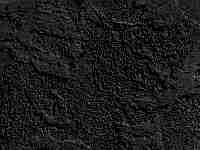 Has fallen, that Cormyr may Stand. My Azoun shall not be so easily forgotten. And be happy, as I am. The gods granted us that. He was Cormyr's all his years. The gods gave that gift to us all. No tears can bring him back. 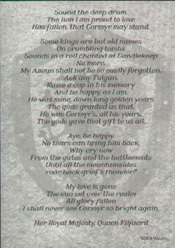 I shall never see Cormyr so bright again.